To prepare for this fine Holiday of Love, I’ve pulled a card asking for advice on how to make the day especially happy and romantic. The card I got was the Four of Wands. The picture on the Rider Waite Smith version of this card pretty well speaks for itself – CELEBRATE!! 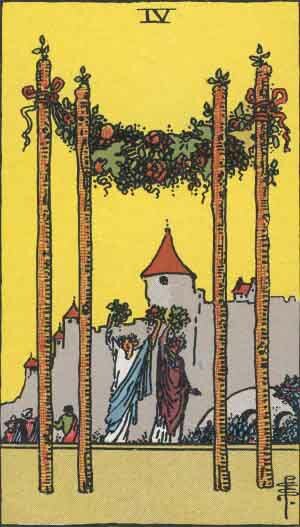 The Four of Wands is all about celebration, gathering with others, and enjoying life. As advice, this card suggests the importance of letting your partner know you’re serious about the relationship, but it’s also asking you to just have fun. Don’t get all heavy, or overly sentimental, just get out there and enjoy each other. Have a great day, and let love rule! § 2 Responses to Love and the 4 of Wands"
Happy Friday the 13th pre-Valentine’s Day!!! Would love to see you soon! Have a wonderful weekend George! You are currently reading Love and the 4 of Wands at The Tarot Room.